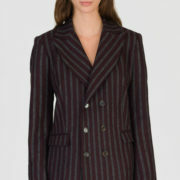 This crossed blazer with its large tailor collar and double buttoning closing system is offered in bordeaux stripes wool woven in Italy. Its two welt side pockets (with a flap) and two slits at the back give your silhouette an elegant allure. The long belt allows you to adjust the volume to your preference. The blazer’s body is entirely lined and will keep you warm all winter. The model measures 5’8.5″ and wears a size 1 (US 4/6 ; UK 8/10). Dry clean. Do not bleach. Do not use a dryer. Iron the lining softly. The DA/DA Diane Ducasse company does its best to deliver according to the country and weight of the order. The shipping time will be specified upon confirmation of the order. The shipping time depends on your choice and will be specified upon confirmation of your order. The DA/DA Diane Ducasse company will ship your orders in France by a pick-up & go location (Mondial Relay), by standard mail (Colissimo) or in express (DHL) according to your choice and internationally in express (DHL). Orders placed on the website and destined outside of France may be subject to taxes or custom fees specified upon delivery. These taxes or custom fees are the customers responsibility and at his/her cost. The DA/DA Diane Ducasse company is not responsible for informing the customer of these taxes or custom fees. In case of absence of the addressee at the time of delivery in Eastern Europe, Maghreb, USA, Canada, Africa, Middle East, South America, Asia, Oceania, the package will automatically be returned at the customer’s cost. The cost will be specified according to the destination. The DA/DA Diane Ducasse company has a ten (10) days return policy: any unwanted items must be shipped/postmarked within ten (10) days of receipt. The customer has a right of withdrawal that they may exercise, without having to give their reasons, for a period of seven (7) clear days as from the time of receiving the items. In this context, they have the option to return the items delivered during this timeframe, in their original packaging, in perfect condition, undamaged, and neither spoilt nor dirty, and fully complete (with any accessories, notice, guarantee, etc.) and accompanied by a copy of the sales invoice and a return slip. It will be up to the customer to keep any proof of having made this return, which presupposes that the items are returned by recorded delivery or by any other means that makes it possible to establish a certain date. At all events, the customer will be responsible for paying for the cost of returning the items. The DA/DA Diane Ducasse company will cover return shipping costs. The Customer undertakes to inform in the meantime the DA/DA Diane Ducasse company’s customer service by sending, if possible, a copy of the report sheet. The DA/DA Diane Ducasse company will do its best to reach an agreement with the Customer regarding the refund of the Customer. The customer must send the order back within 6 days for orders placed in France, or 9 days for orders placed in Europe and internationally. This rule applies starting from the day he/she has informed the company of his/her intention to return the order. In case the customer doesn’t respect the return obligation policy by sending the order the exact way he/she received it within 6 days, the company witholds the rights to not refund the customer’s card (used for purchase) with the amount equal to the price (plus TVA) of the damaged good the company did not receive. The company will refund its customer upon receiving the invoice within a 14 days timeframe. All extra costs will be the customer’s responsibility.